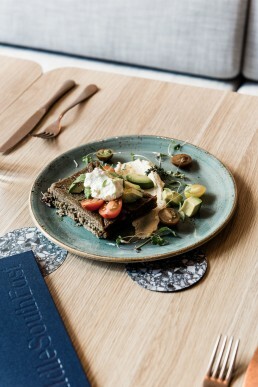 [Extract] Adding to Melbourne’s mélange of fusion restaurants, Middle South East finds a medium between Middle Eastern flavours and modern Australian dishes. This is continued in the interiors, which also takes stylish reference from its situ in blue chip South Yarra. Here, local design studio Biasol have given the space a traditional earthy meets contemporary aesthetic with a main bar area, which houses a range of pastries and freshly made sandwiches, laid with salmon and coral coloured tiles.